The biography you are now reading has turned out a little bit personal. Please, excuse me but I cannot write about him without my emotions and memories. I have made every effort to compile a summarized text larded with my own memories, without the aim at completeness. 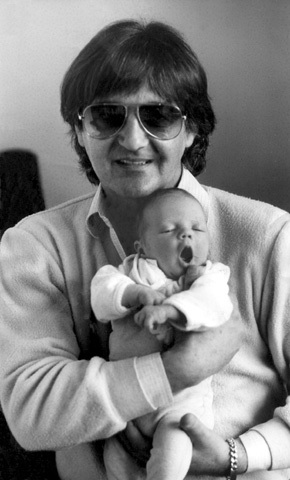 My father, Gábor Ihász, was born on 29th October, 1946. His mother was a cook-maid, his father worked as an officer for the Army, in his free time he pursued a football referee career. 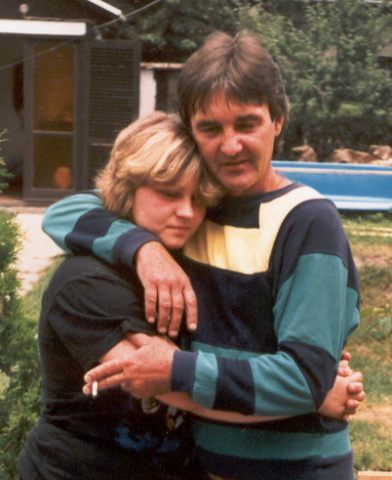 My father was tenderly attached to his parents. He wrote a song after his mother’s death, entitled “Az elmúlt év” (“Last Year”). This song was the most difficult for him to sing for record in studio. My father started his secondary school education at János Irinyi Grammar School and Vocational School for Chemical Industry (between 1961 and 1963), then completed his studies at Ferenc Kölcsey Grammar School, where he took his final exams successfully. Here he met my mother, Éva Pintér, after that they got married in 1966. I was born as the sweet fruit of this love in 1968. He began his adulthood happily and with a huge desire for freedom. 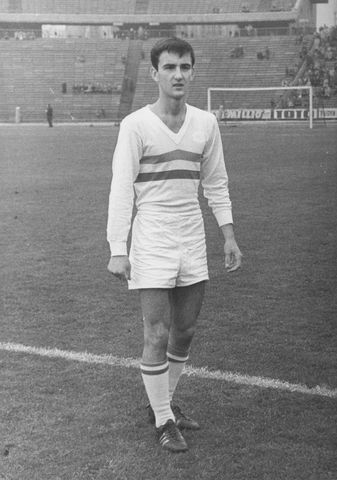 Like his brother, he also kicked the ball for the team Vasas, and at the age of 16 he was in the junior National Team. The sport seemed very important in his life, but later, at the age of 20, a routine medical examination pointed out that he had a problem with his heart. He was not allowed to pursue his professional career, and at the same time his sports medical license was revoked. Unwillingly, he accepted his fate. He could stay close to the “smell” of the locker-room, because the next years further on, he spent most of his time at his beloved football club as a masseur. At that time he turned to music as an autodidact. During the long trips to the country and abroad he entertained the players with his own songs . In his musical career three great personalities played an important part. 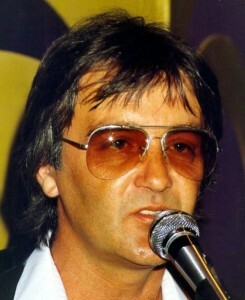 First, I would like to mention István S. Nagy, who was his close friend and co-writer. I remember the endless nights when I was present at the births of his songs, which usually took till the first blush of dawn in very good mood. This was the happiest period in his life. István S. Nagy had a very important role in his greatest hit “Múlnak a gyermekévek” (Passing Childhood”) /1977/. This song flew him into the forefront of Hungarian light music. Péter Máté and Pál Szécsi stood very near to him both in private life and music. He wrote wonderful and successful pieces of music for them. Péter Máté must have been his idol. I would like to list some more fellow-musicians who were close to him in life and work: Miklós Malek, Antal Solymos, Gábor Heilig, András Payer. Although the contemporary musical management put obstacles in his career, two albums of his appeared during his lifetime, and one album posthumously. He was trying to make his way with greater and greater determination. He divorced from my mother, but was in a very close connection with me in the future, too. His second wife, Mária Hajós, played handball at Vasas, and, she achieved outstanding results. In summer 1981 my younger brother was born, who is also called Gábor Ihász. Of course, it is impossible to write about his life in short. He was a simple man and was brimming with life. His lifestyle was free from ostentation and stardom, although he was mad about cars. He owned a few dream-cars, including the one in which Gagarin had been driven along in front of a crowd giving him an ovation. He loved his family, people and life. He passed away on 29th June, 1989 after a long, cruel illness and endless sufferings. His absence today is as painful as it was 15 years ago. He will never sing like he did a long time ago sitting on my bed with his guitar. His memory will always be with me, his songs are still sounding beautifully and truthfully. I can only be near him in the peacefulness of the cemetery, although this is the very place where I do not go too often, because his death leaves a gap that cannot be filled, and it is so painful. When we visited his parents’ grave together, he said to me: ” My dear Adri, we don’t come here too often because I haven’t got a bad conscience. I was always with them as much as possible while they were alive.” I also keep saying this to my son because I was with him as far as possible. Gábor Ihász lived for 42 years.